Bob is a handsome marmalade tomcat. You might have seen him around. His human is James Bowen, who was busking, selling The Big Issue and recovering from heroin addiction when he found Bob on his doorstep in 2007. Bob followed James on to the bus one morning and became part of his pitch outside Angel tube. ‘A Street Cat Named Bob’ tells their story. Luke Treadaway gives a lovely, sensitive performance as James. Bob, feeling no other cat could do him justice – the diva – plays himself (with the help of some stunt doubles). The thing is, and there’s no way of saying this nicely, Bob’s acting is not exactly the cat’s meow. Aloof and borderline moody, he spends most of the film with the grumpy expression of the Queen opening parliament. Really? This? Again? There’s a telly-ish feel to much of ‘A Street Cat Named Bob’, an attempt to sanitise life on the streets. Some of the side plots are deeply unconvincing, such as James’s relationship with his kooky vegan neighbour. But it’s impossible to watch a film about a happy-ending story like James and Bob’s without a warm glow – a literary agent spotted them outside Angel and James’s memoir became an overnight bestseller. There are some nice touches too, like the lady with a Waitrose carrier bag who tries to buy Bob from James for her son. ‘How much for your kid?’ he snaps back. I don't care that this movie is a bit saccharin and shot in a format that makes it a little bit glossier than it needs to be, it's a truly wonderful tale and I cannot get over that amazing cat. I do think everyone should read the book first though, as you get a deeper understanding of James and what he goes through and I also recommend you watch the behind the scenes as that too explains a lot. For me the real charm and wonderful fact is that Bob pretty much plays himself, how absolutely fantastic is that? This film is about the awfulness of homelessness and drug addiction and the messes that people get themselves into that become almost impossible to get out of. It's about the good side of humans (the social worker that supports James and the Big Issue staff are amazing) and the bad side. About how small acts of kindness can make someone's life so much better, no matter how bad it is and it's about love and having something to care about, helping a human being through their darkest time. It's not often in life that wonderful miracles happen, when a person who's been so completely down on their luck, has a complete turnaround as James does with his encounter and relationship with Bob, that it goes without saying that this film is really wonderful celebration of Bob saving James life. If Ihadn't known that this was a true story, I would have thought that it was a bit far fetched. I love cats and I love London, so I knew that I would be on to a winner. I think the story is quite well known already from the best selling book, but it is about a cat who adopts a human and travels everywhere with him. James is a Big Issue seller and Bob stays happily with him on the street, which is unusual for a cat. What I particularly liked, was the fact that Bob played himself for a large part of the film. Definitely a feel good movie to see someone transform their life through the love of a cat. This film touches a lot of sensitive subjects such as drug addiction, homelessness, loneliness, family issues and so on and has much darkness in it because obviously the story is dark but it still manages to be so uplifting! The fact that most of the time, the real Bob plays Bob is fantastic! I didn't know James' and Bob's story before but I loved it and I found it very inspiring, it had me from the trailer! I particularly liked this movie because of two main reasons: Bob and London! I recommend it either for cinema or for home, definitely worth watching! It has a bit of Christmas in it so it is a good timing. What this movie offers, unlike many other films in cinemas at the moment, is the feelgood factor. 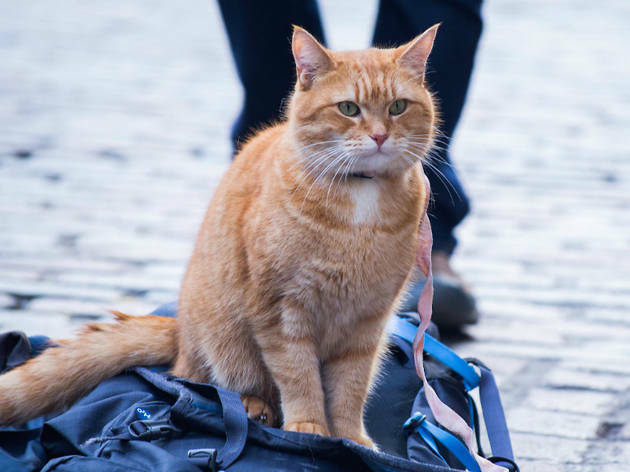 Watching the film is a mostly comfortable process – although there are some dark/hard-hitting moments, unsurprising considering the topics, the film follows a familiar narrative telling a story that will leave you feline good. If you’ve read James Bowen’s 2013 autobiographical novel of the same name you’ll be seeing a familiar story that has little changes from its transition onto the big screen. 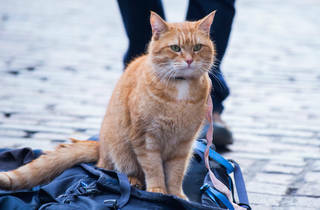 Instead there are only two additions which simply add to the film – a truly lovely soundtrack comprised of Treadaway as Bowen busking and lots of shots from Bob the Cat’s point of view. In fact it’s the success of these moments that almost takes away from Bowen’s story.Bob – playing himself – is such an extraordinary and engaging presence on the screen that he totally steals the show. It regularly feels that his human counterpart is in fact his sidekick – something which Treadaway as Bowen says repeatedly during the film. In a way this in turn forces the film to become more lightweight and throwaway – we want to see/hear more about James aside from brief sound bites of dialogue-as-exposition. However this does not detract from its sensitive treatment of serious topics in a way that all the family can access. This is a very different film from ‘I,Daniel Blake’ (click here for my review of that incredible film) yet I sincerely hope people take away a simillar message about community. As Christmas and its hostile weather is fast approaching we must think more about those who have no shelter from it. Bob the Cat provided James Bowen with a second chance; may we help others get theirs. Really enjoyed this easy-going Film. It tackles some big issues without making them too stark. Drug addiction, Homelessness, Overdose, Death, Cold Turkey ..... and Cats ! With a list like that it should be uncomfortable to watch, but its not. In fact its easy armchair viewing, and the whole thing leaves you feeling that every single person on the planet deserves and should grasp a second chance. Heartwarming, uplifting and broadly based on a true story. What a wonderful way to send a Tuesday night. Thanks to Time Out for screening. Good choice !